The infamous Rio Claro Floating Tour departs Drake Bay at 8am and returns at approximately 1:30pm. 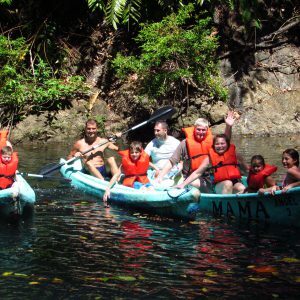 It includes a 30 minute car journey into the hills of Drake Bay, where you will enjoy a hike through primary forest, visit a waterfall and then float down the Rio Claro to the ocean. The tour includes bilingual guide, snacks and transportation by 4×4 taxi. You should bring light tennis shoes (be aware that they will get wet! ), sun protection and a waterproof camera. We recommend that you pack light for this tour! 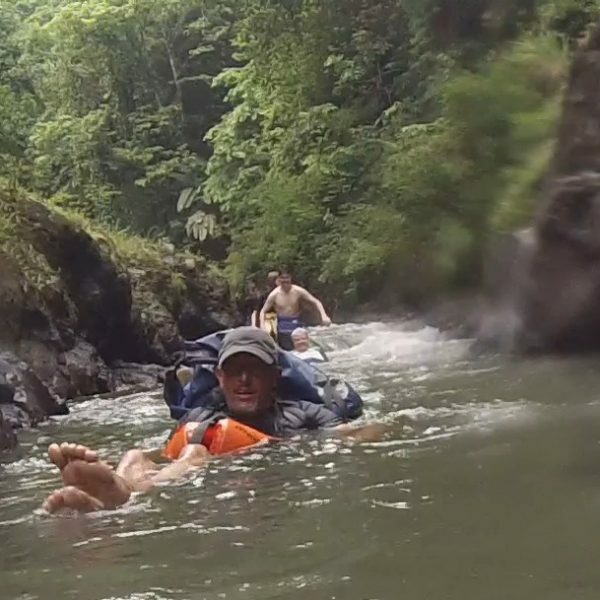 The Rio Claro Floating Tour is subject to availability. The guide must have a minimum of 4 people to make a tour. We recommend that you reserve as soon as possible so that they can organize a group. There are many primary jungles (environments that have not been altered by humans) in and around the Drake Bay area. 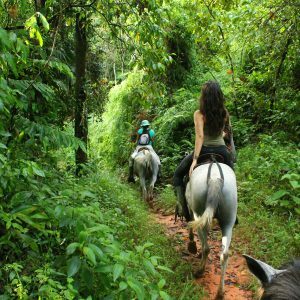 The Floating Tour adventure begins with a relatively short taxi ride to one of the best primary jungles located outside of Corcovado National Park. 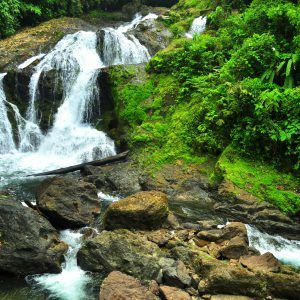 After about an hour and a half of trekking with your informative guide, the group will arrive at the best of 6 waterfalls in the area. After hiking through the jungle and experiencing the awesome bio-diversity, swimming in the cool water here is simply perfect- deep pools carved out over millions of years, surrounded by jungle and volcanic rock jumps. Understanding that few tourists go beyond “Sirena Ranger Station, Cano Island, and Day at the Beach”, you can probably paint your own picture of how unspoilt this spot is. 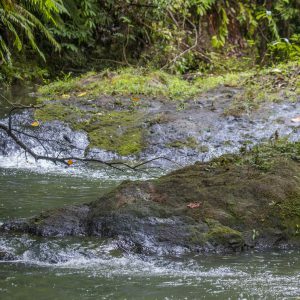 The sounds of water crashing and jungle living from all directions is a truly meditative experience. After the swim, a snack is offered and the group will take another 5 minute walk to where the stream joins the infamous Rio Claro (Clear River). Zip-up life jackets are provided and worn upside down with legs protruding through the arm holes. Picture the jacket’s head hole located between your legs and you’ve got the idea! This fashion statement has 2 functions: a floatation device; and protection for your bum and torso. It is always encouraged to go feet first but the life jacket’s protection is convenient in cases where you find yourself mesmerized by the passing jungle canopy above. Eventually the ocean is upon you and you’ll find yourself on a spectacular surfing beach. The only sign of human life will be the living quarters of Ricardo, local turtle conservationist. Both he and his wife Mod, live together in a “Gilligan’s Island” paradise. The relaxed environment is great for a snack and coffee or tea. Often, Ricardo will speak about his many years of effort in saving sea turtle nests from poaching and predation. The work he does requires much effort as it is a constant race to discover the eggs before dogs or poachers do. Too many beaches for only 1 Tico. Volunteer positions are available and over the years several very helpful visitors have participated in the project. However, since few people know about this stunning location, more are always needed. Sadly, the struggle to keep these ancient creatures around seems less and less hopeful. After enjoying this scenic piece of paradise, the group walks the beach trail alongside approximately 10 other beautiful beaches. A trail has recently been opened from Caletas beach to accommodate 4×4 vehicles, so a taxi will collect you from here and return you to Drake Bay. I’ve personally done the Rio Claro Floating tour more times than I can count, which is probably the best endorsement I can give it!